• Filthy conditions, such as stacked cages that allow feces and urine to rain down on the dogs in lower tiers. And remember how the tea partiers claimed that all the existing laws take care of this problem? Well, the report also found that many of the mills already had over 50 state or federal welfare violations over the last few years yet were still liscensed. In fact, one kennel, S & & Family Puppies, had "more than 500 pages of Animal Welfare Act violations and enforcement records on file with the USDA." 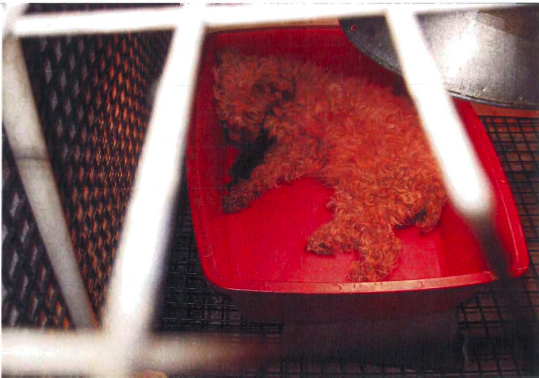 Approximately 200,000 dogs are confined for life in small wire cages in puppy mills in Missouri, many of them in conditions like those described above. This is simply unacceptable. Under Proposition B, the Puppy Mill Cruelty Prevention Act, conditions leading to distress and suffering in dogs, such as painful wire flooring, lack of proper vet care, overcrowded cages, and scant protection from the elements will be more clearly addressed under the law. Proposition B’s requirements are extremely modest and, unlike the current regulatory scheme which is complex and difficult to understand, will provide clear and consistent guidance to inspectors. The measure requires access to nutritious food daily and continuous access to drinkable water, veterinary care for illness or injury, and adequate space and exercise. Proposition B will increase enforcement in general, and specifically increase and facilitate local law enforcement as compared to the existing vague and highly technical puppy mill regulations. The measure not only provides new, easily understandable criminal penalties for mistreatment, it does so without wiping out or eliminating the existing laws and penalties. Proposition B will apply to all large-scale commercial dog dealers whether the owner is licensed or not, and ensures that dogs in such large-scale breeding facilities receive basic humane care. Dogs in Missouri deserve no less than these basic protections. Remember: Vote Yes on Prop B! Paraphrasing South Park: "They'll take our dogs!" Whoops! Kinder Walked Right Into That One! Is The St. Louis Tea Party Breaking Election Law? Don't Let Dishonest Tea Prevail!